What are your chances of being in a wilderness emergency? My guess is about the same as winning the lottery. Every year, millions of people enjoy the backcountry with no incidents, accidents, or injuries. Driving to and from your destination is way more dangerous than getting out in the woods. According to statistics, eating greasy cheeseburgers, texting while you are driving, and smoking like a chimney on the way is more likely to lead to your demise than anything in the woods. I say all that because, I post these stories not as a fear tactic, but as a learning tool. However, applying simple math, the more time you spend outside in the woods, the greater the chances of injury or having to spend the night out. I theorize that by studying incidents, one’s awareness and knowledge base increases, thereby decreasing your overall risk of coming home with cool scars and stories. That being said, two stories this week highlight the effect weather can have on air operations during a search and rescues. We all know that bad weather can be a catalyst for wilderness emergencies. Having a good understanding of the use, capabilities, and limitations of air assets in Search and Rescue incidents can arm you with better information for making decisions or handling morale. I know of cases where dispatchers have been verbally thrashed for not launching helicopters when the reporting party insisted. Two stories this week highlight the reality of bad weather on SAR’s. Hypothermia. Note that evacuation by air was not possible due to the weather. On March 16th, northwest Arkansas received about two inches of rain overnight and had temperatures in the low 30s, leading to a sleet/snowstorm that eventually dropped three to four inches of snow. While on patrol in the Steel Creek area of the park, protection ranger Mark Miller contacted a visitor for speeding. The man told Miller that he was rushing in order to shuttle out people who’d hiked out from an overnight stay in the Ponca Wilderness, adding that one of the hikers, a young woman, was not feeling well due to being sick earlier in the week. Miller offered to assist with the shuttle and hiked down the trail to check on the young woman. He contacted several members of the hiking party who affirmed that she wasn’t feeling well, but did not give Miller the impression that she was in need of assistance. Further down the trail, he contacted a man from the party who informed him that she was unconscious. Miller immediately stepped up his response, contacting the Midwest Region Ozark Communication Center and asking that they send out an alert for the Buffalo Search and Rescue Team. A mile and a half down trail, Miller found the 17-year-old girl, who was semi-conscious, wrapped in a wet sleeping bag with her mother. She was placed in a heat blanket and a sleeping bag and then onto a litter for transport and was treated for hypothermia and very low blood sugar by an on scene paramedic. Responders conducted a carryout over a mile and a half of very rough muddy trail and across one high water creek. The mother was treated for mild hypothermia and was able to hike out on her own. Due to nearly whiteout conditions, the Air Evac helicopter was unable to respond, so the girl was taken by ambulance to North Arkansas Regional Medical Center in Harrison, Arkansas, which is over an hour from the trailhead. At the hospital her core temperature was discovered to be 84 degrees. 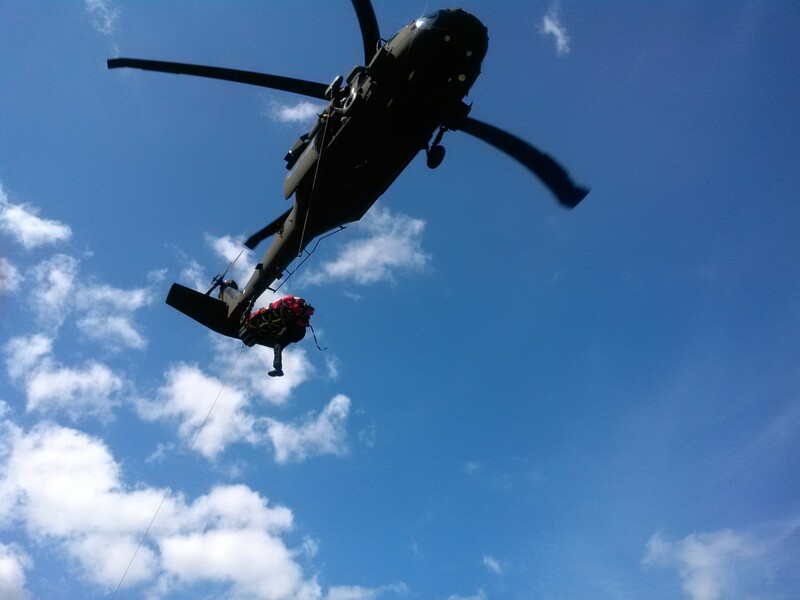 Miller’s attention and quick response likely saved the lives of two under prepared hikers. Fifty four responders, most of them volunteers, assisted in the rescue. They came from the following agencies and organizations – Buffalo River Search and Rescue Team, Harrison Fire Department, Tri County SAR Team, Mennonite Search and Rescue Services, Newton County Sheriff’s Department and SAR Team, North Arkansas Regional Medical Center, and the Arkansas Forestry Commission. The weather was atrocious, but that did not stop the volunteers from coming out to assist. Buffalo National River staff are very appreciative of their valuable assistance. On Tuesday, March 11th, Zion dispatch received a report of an injured canyoneer in Jolly Gulch along the park’s eastern boundary. Initial responders discovered that the man had fallen approximately 30 feet unrestrained and bounced several times off the rock wall before landing on the canyon bottom. He was not wearing a helmet and suffered significant multi-system trauma. Due to a lengthy carryout and his deteriorating condition, Grand Canyon helitack was asked to assist with a short-haul operation. In order to get to an appropriate short-haul extraction point, Zion rescuers needed to move the 250-pound man out of a pothole, perform a technical lowering operation, hand carry him down two more vertical drops up to ten feet in height, and navigate a slot canyon layered with snow and ice filled pools – all while in a canyon that was only three feet wide in places. Gusty, erratic winds hampered the short-haul efforts before the Grand Canyon helitack crew was able to successfully extract the man and a Zion rescuer. To further complicate logistics during the mission, LifeFlight AirMedical (St. George, Utah) was diverted from this mission to another one, but Classic LifeGuard (Page, Arizona) was able to fly the man to a medical care facility. This entry was posted in Survival Weekly and tagged backpacking, helicopter rescue, hiking, hypothermia, search and rescue, wilderness survival on March 22, 2014 by bigpigoutdoors.